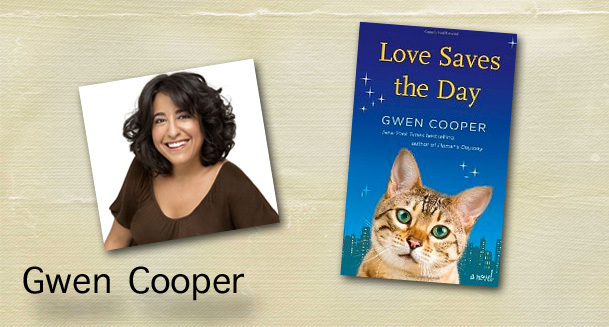 Love Saves The Day, the newest book (this time a novel) by bestselling author Gwen Cooper, officially goes on sale today. Those who have followed Gwen and her story of Homer’s Odyssey:A Fearless Feline Tale (about her blind cat Homer), have been anxiously awaiting January 15. Regarding copyright: (a) I have kept the images small and (b) the image promotes the work of the author and the author herself and therefore is not detrimental from a commercial standpoint – the opposite in fact. This story follows the life of Prudence the cat and her human owners Sarah and Laura. It tells of a rocky relationship between a mother and daughter. Prudence tells of her life between two families as only a cat can describe what it’s like to live with human companions. Sarah and Laura also have chapters in the book where they give their point of view. Gwen has a special offer for those who purchase any form of Love Saves The Day up until 12 a.m. PST on January 21. Just send a proof of purchase (a scanned receipt or email sale confirmation) to gwencoopercontests@gmail.com for a chance to win one of three prizes. Grand prize will be a visit from Gwen Cooper herself. Gwen will come to your home or any other place of your choosing to lead a book discussion. She will also donate $500 to the animal charity of your choice. Second prize is a portrait of your pet by Sue Hains. Sue is the artist who did the portrait of Homer that graces the cover of Homer’s Odyssey:A Fearless Feline Tale. Sue can work from photos, so an actual visit by her isn’t necessary. Third prize is an autographed copy of Love Saves The Day, plus an original autographed artwork of Homer(by Homer) used for Homer’s Odyssey. Gwen is planning a 15-city book tour to promote her newest book. Instead of meeting fans and other cat lover’s in bookstores, Gwen will be visiting animal shelters. The tour won’t begin until sometime in April or May. She plans to visit one shelter per week and spend some quality time at each shelter. At most, Gwen will be away from Homer only a few days each week. A few months back I reported on Homer being ill. According to his vet, Homer should be dead. According to Homer, he should be fed fresh, moist turkey. Homer is so spoiled to this that he turns his little nose up at day old turkey. His human servant Laurence(also known as Gwen’s husband) now has to make daily visits to the neighborhood deli. Due to his recent illness, Homer has developed a fear of anyone who isn’t Gwen. This makes leaving him for any amount of time more difficult. Gwen has a different life than those of us who have to physically go to an office each day. For the past five years, she’s been able to work from home. With the exception of a few business trips, Gwen and Homer have spent 21 hours a day with each other. The past three years have enabled Gwen to care for several elderly cats as she nursed them through various cat illnesses. Unfortunately, the life of an author requires that author to go on the road and make personal appearances in order to sell more books. Authors have all the same bills as the rest of us. Gwen has to pay rent, utility bills, buy food and purchase health insurance. Health insurance in the U.S. is quite high when not purchased through your employer. Because it’s a delicate balance in caring for her family and being there 24/7, it just isn’t good financially for her not to promote her book as much as possible. This includes getting out and meeting her fans. She has to take Homer’s health into consideration and balance it with what’s best for the entire household. I admire Gwen Cooper. I’ve followed the story of Homer for several years now. First as a blind kitty living with Gwen. Then with Homer being a survivor of the aftermath of 9/11, and finally with his recent illness. Gwen is doing a service for cats everywhere with her life. She first told us how it’s possible to live with a blind cat. Now she’s donating $500 as part of the grand prize regarding Love Saves The Day. The idea of having a book tour held at local shelters is a stroke of genius. It will get publicity for those shelters, as I imagine the local news in each of those cities will cover her visit and bring exposure to the shelter. Kudos, Gwen. You have a very balanced life. You’ve managed to take something you love to do and found a way for it to help cats as well as their companions. Homer’s Odyssey sold more than 200,000 in the U.S. alone. I predict Love Saves The Day will equal or surpass Homer’s book. Especially with ebook format such as Kindle now being the method of choice for many readers. This entry was posted in Articles of Elisa Black-Taylor, Cat Behavior, cat personality, Cat Products, Moggie and tagged book about a cat, cat products, gwen cooper, love saves the day by Michael Broad. Bookmark the permalink. Michael, my next article is a “manual” so you should find it interesting. Will send soon. It’s on publishing an ebook to benefit cats. Lovely, I can get my teeth into that! I have not read her books. I don’t read novels. I tend to stick to manuals! I like books with information but apparently this book does have information in it as it tells us how cats feel and are affected by people. It sounds as if it is both a story and gentle instruction on cat caretaking. I read everything. Just finished a book on how to survive a pandemic. Now I’m back to a novel called Jenny Pox about a girl who kills with her touch. You need to check out Gwens website as it tells how to live with a blind cat. Elisa, thanks for this. I blogged about Gwen’s book contest on Saturday. She had emailed me about Homer’s improved health and I feel awful that she had to justify what she’s doing. Did anyone criticize Jackson Galaxy leaving his old sick pets while he shoots his TV show or promotes his book?Those of us who love our pets but work professional in the pet world can’t please everyone. I don’t think a lot of people realize the tax and insurance responsibility of the self employed. You can’t just let a book sit there and not promote it any way you can to get people to read it. I don’t believe those who critisized Gwen thought about the big picture of her responsibilities. Great news. Lets hope Homer will be better in time for the tour – or at least stable in relative terms so she is safe to go. I am sure after the first trip Homer’s reaction will dictate whether futher trips should follow. I’d like to read the new book.